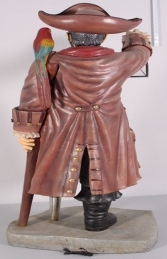 This imposing life-size pirate model stands at 7ft tall with his wooden-leg, parrot, lantern, skull and cross bone hat, he is the archetypal pirate figure. 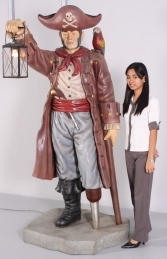 He is ideal for any Pirate themed area. 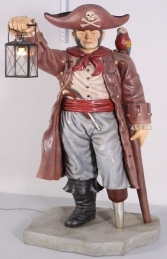 Our Pirate with lantern is a fantastic character figure full of detail with his clothing and a lantern that lights up with his parrot sat on his shoulder makes him an impressive model all made from resin. This imposing Pirate model looks superb on his own or with our other Pirate models for creating a Smugglers cave scene or in any Nautical or Pirate themed area or in shops, businesses, pubs, restaurants, coffee shops, adventure golf courses, zoos, theme-parks or even in your own home.